It is the 1970s, and a mean and dirty war is being waged on British soil. Sectarian violence is an almost daily occurrence and the terrorist groups, who finance their operations through robbery, fraud and extortion, engage in torture, assassination and wholesale slaughter. To cope with the terrorists' activities the British Army need the support of exceptional soldiers who can operate deep undercover - the SAS. The regiment is soon embroiled in some of the most secretive, dangerous and controversial activities in its history. These include plain-clothes work in the towns and cities, the running of operational posts in rural areas, surveillance and intelligence gathering, ambushes and daring cross-border raids. 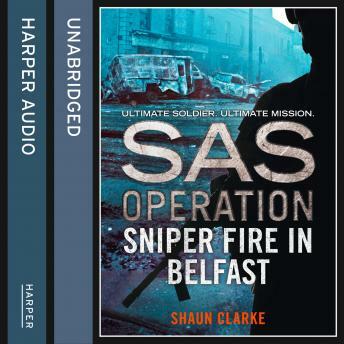 Sniper Fire in Belfast is a nerve-jangling adventure about the most daring soldiers in military history, where friend and foe look the same and each encounter could be their last.